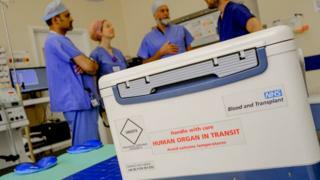 A leading transplant surgeon says Northern Ireland is "not ready" for the opt-out organ donation system being used and proposed for other parts of the UK. Dr Tim Brown, who has carried out more than 350 transplant operations in Northern Ireland, wants to maintain the "status quo". He said he does not believe "there is any data to support an opt-out system". Northern Ireland could soon be the only region of the UK without the system. Does an opt-out system increase transplants? It assumes that everyone is a potential donor unless they sign a register to say they do not want their organs donated. The system is already in place in Wales while England, Scotland and the Republic of Ireland are expected to follow suit. Dr Brown told BBC News NI's The View programme that Northern Ireland has a "system that works at the minute". "The numbers are going up every year so why would we potentially wreck a situation that is working and move into a situation that has no evidence to support it," he said. He added that it was too early to say if the "experiment" in Wales had increased the rates of organ donation. Dr Brown also said it was not as simple as changing laws. "In the countries that have leading donor rates - Croatia, Spain and Portugal - they have a cultural attitude to organ donation where organ donation is the normal thing to do in the circumstances of an untimely tragedy. "What we have to do as a society across the UK is change people's hearts and minds where they become culturally aware of organ donation." But one of his most high-profile transplant patients takes a different view. Shane Finnegan, who received a kidney from GAA star Joe Brolly, supports new opt-out legislation but only if families have the final say. "This legislation does not need to be complicated, does not need to be difficult, it needs to be simple. Families are at the heart of this process," said Mr Finnegan, who received a second kidney transplant after the donation from Joe Brolly failed. He also called for more investment in promotion to change the culture around organ donation. Mr Brolly is also in favour of a change in the law to support a "soft opt-out" system, which is being considered in the Irish Republic. "If you are going to have a bill, call it a family consent bill and make it easily understood. "Because what people don't understand is that, whether you are on the organ donation register or not, your family must consent and those are the only circumstances in which doctors will ever retrieve organs. "It's the only system that can work because organ donation in the end has to be a gift." He also revealed that he is one of 78 living donors in Northern Ireland today compared to seven in 2011. Both men had initially supported a bill brought by Ulster Unionist MLA Jo-Anne Dobson to change the laws here, but later withdrew their backing. The bill was rejected by assembly members on the health committee. Meanwhile, the BBC has learned that more than 500 families across the UK have blocked organ donation from a deceased relative, despite them being on the organ donor register. The figures cover the past five years. Legally, the deceased person's wishes should be respected but that does not always happen in practice. The most common reason for not wanting a loved one's organs to be donated is how long the process takes. You can see more on The View on BBC One Northern Ireland at 22:40 BST on Thursday. Why do England and NI have 'opt-in' organ donation?